Orchids are wild, delicate and exotic, but they also make surprisingly good houseplants. 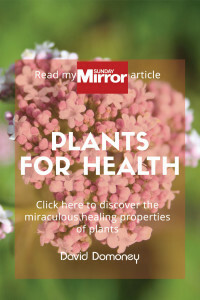 In fact, they are one of the most popular houseplants in Britain today. 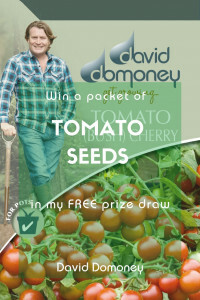 They make excellent presents and are widely available – many supermarkets sell them. 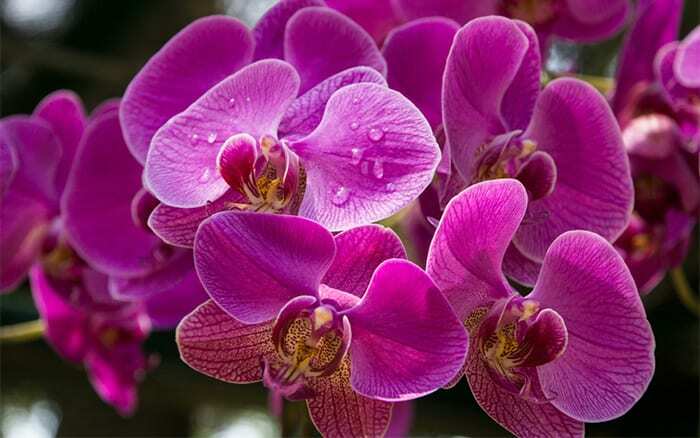 There are many different types of orchid, with a huge variety of shapes and flower colours. The most common is phalaenopsis – a beautiful plant. 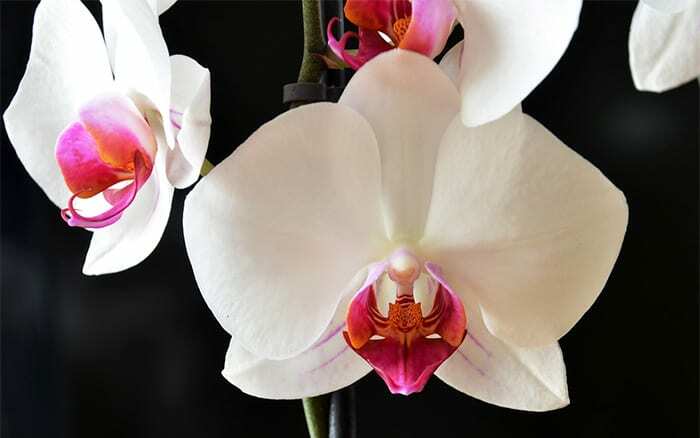 They are known as moth orchids because the flowers grow on arching stems, making it appear as if a group of moths are flying away from the stems. Another variety is cymbidium, which are marvellous orchids with strong, structured flower heads. Or try dendrobiums, which bear flowers almost the whole way up the stem. They also flower for a long period of time. 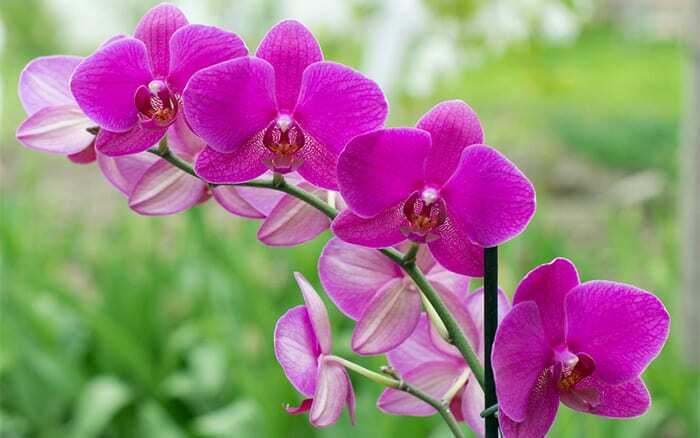 Orchids have a very long flowering season, but often people don’t get to enjoy them for long. Treat them wrong and they might only last a month or two. Treat them right and they will flower for months, year after year. Some orchids you buy come in clear plastic containers and have green roots. This is because orchids are epiphytes, meaning they grow non-parasitically on another plant. In the wild they grow on the sides of trees. Because they are not in soil, the roots have evolved to contain chlorophyll so they can photosynthesise just like leaves. The best thing to do with these types of orchid is to keep it in a clear container like glass or plastic and never put a pot cover on it. The roots need to be exposed to the light to photosynthesise. Obviously you should never let them dry out, but don’t let them become waterlogged either. In the wild, orchids cling to rocks or trees and avoid stagnant water like the plague. If you leave them sitting in water, they’ll die. Use a spoonful or two of tepid water a week to keep them moist. They also love having water in the air, so a bathroom or kitchen shelf or windowsill with high humidity will make a great home. Orchids hate having too much direct sunlight. A semi-shady east or west-facing windowsill is ideal, especially in the summer. If it’s too bright you risk burning the leaves, but if it’s too dark you won’t get flowers. Temperature wise, a constant 19C is fine. 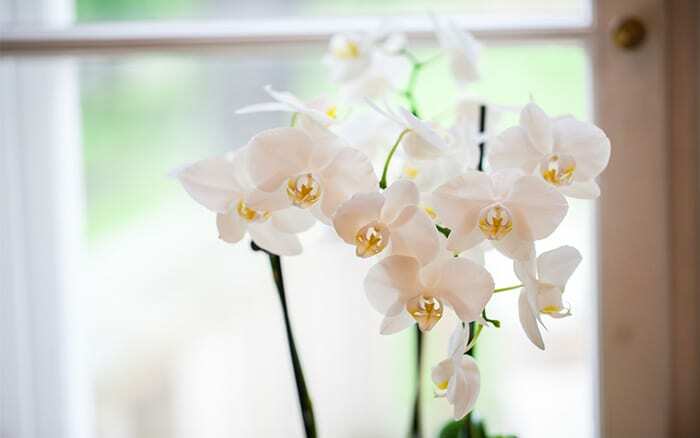 Avoid putting orchids too close to radiators or letting the temperature fluctuate wildly. If you keep their conditions stable, they can focus on producing beautiful flowers. Yes, you can prune them. When the last bloom fades, snip off the flower spike to just above the bud, an inch or so below the last flower. That will help a new shoot to form, bringing with it plenty of new flowers. 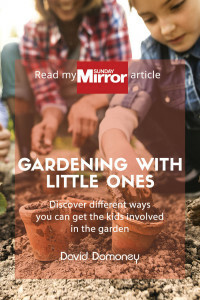 The odd drop of fertiliser will also help keep your plant vibrant. Watch out for yellow leaves. Older leaves will naturally turn yellow and can be removed. But any yellowing in young leaves is a sign of stress – too much light, over-watering or very low temperatures. If you have this, you can stop watering and move your orchid to somewhere it has the right conditions, and it should recover. Orchids need a special compost which contains more bark than soil. You can also buy special orchid food. This is important to help them generate enough energy to send up flower spikes. 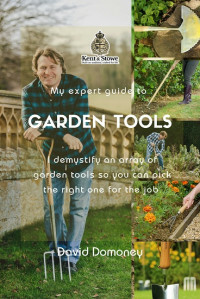 this is really useful David. I have grown orchids for several,years. Ow and just love them. They are not hard to grow and I have several that have flowered again and again. They are lovely in a bathroom as you say. More people should try them. I have one that has flowered continouslysince July 2012 it was given to me by my mother who sadly died in Novemberof that year! One stem got broken and now has a baby plant on it. Should I cut it off and put it in another pot?